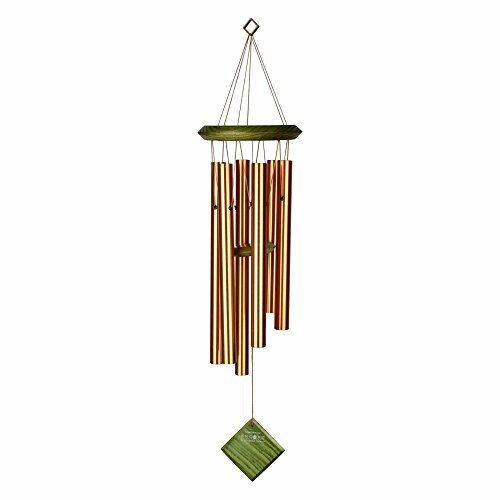 With bronze-finished aluminum tubes and green-tinged wooden hangers and strikers, the Woodstock Encore Pluto Wind Chime is an accent that will add to the serenity you experience while enjoying your deck, patio, or balcony. Named for the mysterious demoted dwarf planet, this chime's five tones play intriguing random melodies when the wind comes through. Pair this chime with others from the Encore Collection to create a richer, fuller, perfectly harmonious soundscape. Hanging length: 27 in.. Tubes created from bronze finished aluminum. Wooden hanger with green finish. D, F, G, Bb, C, D scale. 6 tubes hang around green, wooden sphere.